Raised beds may be the talk of the modern gardener, but they could make gardening easier and improve the productivity of traditional vegetable gardens. 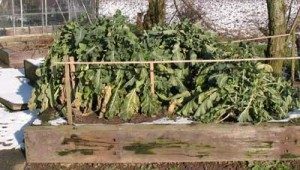 Raised beds have the obvious advantage of being lifted up off the ground so the gardener does not have to bend so far to reach the soil. Plant growth is improved because the un-compacted soil allows good drainage and free root development. The gardener has control over what soil goes into the raised bed. The soil warms up quicker than that in the garden. 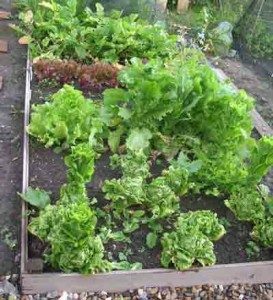 Plants can be grown closer together in a raised bed so the productivity per square foot is increased. Pests and diseases are fewer. Carrot fly is not such a problem because it is a low flier and rarely reaches above 1 foot (25cm). Slug control is easier because they have to climb up the walls to get into the raised bed. It is relatively easy to deter them from the climb, by laying gravel around the outside of the bed, and putting discouraging strips on the outside walls of the bed. 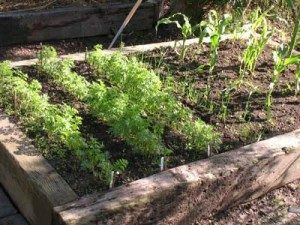 Raised beds offer a different way to grow vegetables and it is worth trying one in the vegetable garden.